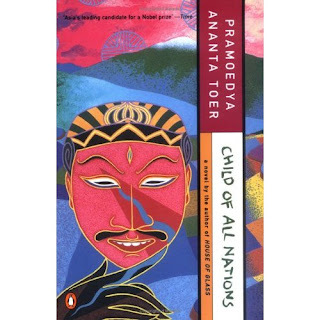 In the Buru Quartet, the four novels which begin with This Earth of Mankind, Pramoedya Ananta Toer has written what should be recognised as the Indonesian War and Peace. Set in Java in the then Dutch East Indies, at the beginning of this century, its subject is nothing less than the broad sweep of Indonesian colonial history and politics. Based on a historical figure, the protagonist, Minke, is a Native Javanese, a Raden Mas or noble who has received a Western education. The first two volumes (also published together as Awakenings) describe Minke's coming of age, caught in a conflict between cultures. In This Earth of Mankind he marries Annelies, the daughter of a Javanese concubine and a Dutch factory owner. When her father dies, she becomes the legal property of her Dutch relatives and is taken to the Netherlands, her Islamic marriage having no standing. In Child of All Nations Minke's real political awakening begins. He starts to write in Malay rather than Dutch, he follows events in Japan and China and in the Philippines, and he experiences firsthand the effects of sugar farming and the exploitation of his own people. In Footsteps Minke moves to Betawi (Jakarta) to study at medical school, though he soon abandons that as a career. He marries a second time, to a Chinese activist, and enters into public political life, founding the first Native organisation and launching a newspaper. This is set against the background of the Dutch conquest of Bali. Minke's "memoirs" end with his exile to Ambon and the narrator in the final novel is Pangemanann, a Western educated Native who has risen in the service of the government, first to police commissioner and then to member of the Algemeene Secretariat, the advisory body to the governor. He chronicles his manipulation, surveillance, and terrorisation of the various opposition movements and leaders, Minke among them. As well as narrating the historical events down to the end of the First World War, House of Glass is a moral condemnation of colonialism from the inside. The novels become progressively heavier with historical and political exposition as the series progresses; they will appeal most obviously to those curious about Indonesian history or the politics of colonialism. But they also retain an easy flow and a vividness which remind one that the first two were originally spoken, in a prison camp where Pramoedya was denied access to writing materials. Pramoedya's works were for many years banned in Indonesia.